Square metal wall tiles are a great way to add interest to your kitchen or bathroom walls. 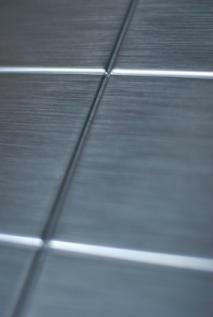 Self adhesive - Many metal wall tiles on the market are self adhesive, meaning no messy grout or mortar. If you are worried about the edges sticking out, no need. These tiles are designed to fit tightly and neatly right up against each other. Durability - Unlike their ceramic or porcelain counterparts, high quality metal wall tiles will not chip, scratch stain or break. Fire resistant - This is particularly important in the kitchen. Metal wall tiles will not catch on fire, so they are perfectly safe for a backsplash behind your stove. This online home improvement catalog offers sets of 48 square tiles that cover six square feet for under $30. The square tiles measure four and one quarter inches. The metal tiles offered by Improvements Catalog are self-adhesive with six different finishes from which to choose. The per tile price at Mechanical Metals ranges from $1.50 to $13.50 per tile, depending on the size and finish of the tile. The Home Market Place sells both square and triangle metal wall tiles in copper, aluminum and black finishes. The square tiles measure at four and one quarter inches and each box covers about three square feet. The online store Cool Tiles is the place to go if you are looking for square metal accent tiles. These metal accent tiles are hand crafted and can be made to order if you would like. Why not consider adding one of these beautiful metal wall tiles for added architectural interest? Metal wall tiles, whether square or triangular, easily transform a drab and lifeless kitchen or bathroom design into a design that is sleek, sparkling and contemporary. These type of metal wall tiles are a great alternative to stainless steel and far, far less expensive. The fact that most of the metal tiles on the market today are self-adhesive and easily trimmed with a pair of scissors means you can finish your metal tiling project and transform your kitchen or bathroom in just one afternoon.